MJF Images Fine Art landscape, nature and travel images from the American West and around the world. A rainbow reflected in a small lake along the Columbia River. It was classic Oregon springtime weather that last day. I’ve been trying to avoid this post for the last few days. This weekend I was shooting at the top of a waterfall, a virtually unknown one called Summit Creek Falls in Oregon’s Columbia River Gorge. It’s rare you can get in a relatively safe position to shoot decent pictures at the lip of a falls. Most of them end up being disappointing because when you look down you lose the sense of depth in pictures. Anyway, while I was there I momentarily broke one of my rules and didn’t have my neckstrap on. Only one other time did I do that in the past couple years, and that’s when the 5DII went in. Murphy’s Law is a vicious thing. Murph took over at that point and my tripod, Canon 5D III and an L lens went over. Amazingly it got caught about 10 feet down off the lip of the 100-foot falls, on a submerged log or rock. After almost dying in a foolish attempt to climb down and get it (maybe a bit of subconscious suicidal thought going on there! ), I stopped and caught my breath and thought about the certain consequence of going any further. I retreated back up, took off my bootlaces, rigged a slip knot and loop, tied off to a long stout stick I found, and went fishing. I was able to grab hold of a tripod leg. It’s funny to think about, but if I still had my fancy Gitzo tripod (which has twist leg locks), I would have never recovered it. With my old trusty Manfrotto that has bulkier lever locks, I was able to grasp it with the loop. After a frantic wrestling match, fighting the implacable, uncaringly powerful spring snowmelt, I got it. An Oregon forest strains the clouds. Fog moves in towards evening in Oregon’s Columbia River Gorge. The gear had been pounded with tons of water for almost an hour. But my tripod and head (not like the camera but not inexpensive either) are fine. I just got off the phone with Canon and they can’t accept it for repair. They say if it’s repairable it would be almost the cost of a new camera. So it’s gone. My bad: no insurance! My backup camera, a 5D II that had itself been repaired from a brief dip at the top of yet another waterfall, I sold a couple months ago to help pay off the bill from the 5D III more quickly. So I’m down to an older point and shoot, which means I’m down to snapshop/street photography only. I am in the worst financial shape of my adult life right now so can’t afford even a used cheaper DSLR. I will likely sell off the rest of my gear and give up the dream of going fully pro, at least for now. 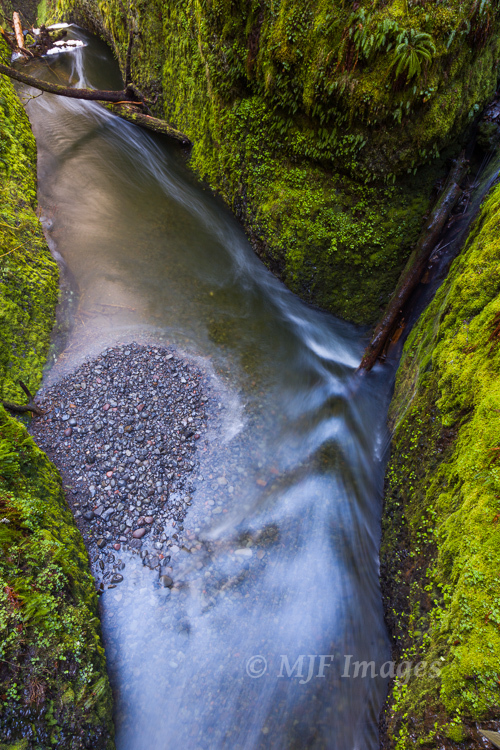 Looking down from a footbridge that spans the top of Oneonta Gorge. I debated discontinuing this blog, but my interests are so varied, and I believe I have much to say. So I’ll keep at it and probably post Friday Foto Talks too, though perhaps not every Friday. One negative about this plan: I’ve been blogging for quite awhile now and I have included many images in my posts, believing that I will always be shooting new images; now that’s not the case, and so some of the example images will be reposts from my archive. So that’s it. A sad week for me, and something big in my life has now gone. A big transition back to just observing light and nature instead of always wanting to capture its beauty. But it’s how I started out and how I came to be a decent photographer in the first place. Please don’t feel bad for me. It was a great run! By the way, these images are from the last day shooting with my camera. CF memory cards are amazing! The very last image. Just ahead is the lip of Summit Creek Falls. Note my tripod leg. Unprocessed & uncropped. Wow. So sorry. Been away for a while myself with family issues. A camera can almost be like family. Glad you’re still using a point n shoot, which can be quite liberating from a shooting perspective. Most importantly never give up the dream! Impermanence. You are adjusting very well. Another camera will come into your life, I am certain of that. Keep on doing what you are doing. Many, I see, look forward to your posts. Thanks! I’m using my P&S now. I just couldn’t stop shooting, but the ability to print large and hang on the wall is gone now. I was told once that you can send a hundred folks with cameras into a ploughed field and they’ll come out with ninety-nine snapshots of ploughed field. One of them, though, will take a Photograph. Think Kipling’s “If” … remember the line about “… and build ’em up, with worn-out tools”? If you really need all the magic bells and whistles to take good shots—naaaaaah, surely not. I haven’t read the comments above yet (I rarely do, until after I’ve commented) then surely someone has mentioned ‘Opportunity shops’? If all you can afford is a box Brownie and one film a month … do it! Get back on that blasted horse~! And eventually show us some more Photographs. Please. Sorry to hear about your accident, but your photos are always stunning, so keep the blog coming. I bought my Gitzo when I was 17 years old. I am now 59. It’s indestructible! I love Manfroto heads too but I’m awfully sorry about your Canon. 😦 Beautiful images, too! They are indeed, but if I had still had my Gitzo t would have been destructed ’cause of the twist locks (wouldn’t have been able to grab ahold of the leg). My head is a Markins, which are close to being bombproof. That Manfrotto tripod was newish too, so I’m glad I got it back. LOL. The twist locks on my Gitzo aren’t too bad for being 42 years young. I was thinking of sending it in for an overhaul. As I am old, I’m not familiar with Markins but I’ll take a look-see. Yep, I thought I wouldn’t like twist locks but the ones on Gitzos are so well made. One of their great features (slim design) in my case would have been a fatal flaw in that they would’ve made the tripod not able to be “caught” while “fishing”. Thanks for the vote of confidence Jennie! Hi. I had to return and tell you, as others have, Thank Goodness You Didn’t Die in the attempt to get your camera back. I’m very sorry to hear about your loss. I hope you continue photography even with the limitations of point and shoot and that you’ll be in a position to return to your beloved camera soon. Your work is very beautiful. Thanks so much for returning and for your nice words. I don’t know what to say. I live in fear of this happening and I’m not even close to the photographer that you are. I am not exaggerating, but your photos are the best of all that I am following here. I love how sharp and clear your work is. And Being from the northwest with ties to Oregon, I love your subject matter. If I could afford and had a place to display your work, I’d buy your wonderful photos. I know that does not help but we are here supporting your work. Wow! Thanks Ron. Yours and others’ comments are just sort of blowing me away. I really appreciate the support! Wow! What a story. I agree with Mr.Zande up there. Keep blogging, and do repost shots from your archive. You are a talented man. I think the main thing all of us here are trying to say is, no matter how awful things might look at the moment, don’t give up! Thanks so much Jakz! I will try. What happened is terrible and I can only imagine how hollow the loss, not of a machine, but of a means of expression and a passion must feel like. I hope you do pursue some of the fundraising opportunities that there are out there but I have another idea you might consider. You have written a great deal on this blog and most of it is really, really useful. You have addressed a lot of things that other photography resources haven’t touched. Your images are fantastic as well. You should sift through it all, categorize it, create a taxonomy and self publish all of it as an ebook. I think a lot of people would find the content of your blog, albeit reorganized, extremely helpful and interesting. You have already done the heavy lifting, now you just need to revise and restructure and you have a source of passive income. Honestly, I think you have enough content to actually do a small series rather than a single book. I have seen a lot of successful ebooks that didn’t have a fraction of the information or quality that your blog has. Thanks so much!! I really appreciate that kind of feedback. It’s one thing to suspect this myself, but another to hear it from a reader. I’m always discounting myself and everything I do. So thanks, and I hope you’re out exploring the Shasta area as much as your heart desires this spring! Glad you are thinking ahead about possible Kickstarter or Indigogo (don’t have experience with this one). You could offer contributors the choice of one of your wonderful photos (digitally, of course) that we could have printed and framed ourselves! I’d be thrilled to have one of your photos! Thank you Mary! I would feel better if I was able to ship a print and provide the file for printing at a larger size if desired. A dramatic story, stunning images and a provocative title – all of that could be expected on your blog. The bad fortune, risk to life and end of a dream was not. The whole idea of chasing your dream is amazing, partly because the ending is unscripted and unpredictable. I am stunned that your images could not generate sizeable income since they were so good though sadly other great photographers have told similar tales. The loss is not yours alone. Your last paragraph is far more clinical than I could ever be and have been in similar situations. I hope this detour results in a good, new path. Hopefully your commitment to the blog remains for all of us. I wish you all the best. Thanks Lyle! It is certainly a detour, but detours can often show you alternatives you would never have encountered had you gone straight ahead! I will continue to blog, and of course check on the adventures of the intrepid Canadian wildlife photographer! Haha! Please stay – I’m glad you survived instead of your camera! That is a bummer. I’ve almost lost my camera a time or two. I will be much more careful now. Oh my. So sorry to hear about the loss of your camera. Fantastic last pics BTW. Please, please, please keep blogging. I so enjoy seeing your photos and reading the wealth of geological information that you provide in your posts. I’ve been thinking about purchasing some of your images for a long time…. have just had a hard time deciding! I agree with Mary… if you decide to do a kickstarter or indegogo project, I’m in for a contribution too. At first I thought you were having us on with an April Fool’s joke Michael. I’m terribly sorry to read about the damage to your equipment, glad that you didn’t continue climbing down the waterfall, and sincerely hope that you’ll continue sharing your expertise with us all and that you’ll be back showing us more terrific photos like these in no time. I’ve been waiting to hear what happened since your last post and I’m so sorry! Please continue to blog, your advice is priceless and your photos are beautiful each time I see them. I so appreciate that Vladimir! I love being virtually out on the water with you. I’ll let you all know if I figure out a way that I can provide something in exchange for any donations. Mary is right!!!!! Don’t ever give up your dream! You’re an awesome photographer and I’ve learned a lot from you. You know you have company! Years ago my camera had about a one second dip in salt water at the beach. The repair place wouldn’t touch it. SO I took it apart and got every grain of sand out with a quilting pin and it worked fine. When my camera fell off the magnetic monopod last fall the lens was toast and I was not a happy camper. I truly love and value your blog. AND I don’t care if you show the same photos and info a zillion times because I love to see them and I need to digest the info again. Thanks Annette, very sweet of you! I have had cameras from the past come back too. I’ve learned that the modern ones are very different beasts altogether. I’ll still blog, but try not to recycle info. at least, haha! I am so sorry to hear about this loss, but you are all right. You were not injured. That is good. Keep blogging. I always look forward to your posts. Bummer man! I hope it all works out! I really like your blog and photo advise. Your photography is too good to let it go like that. I’m in with Mary’s suggestion. Thanks John! I’m still sort of amazed you follow my blog. Yours is the only one of that persuasion that I follow, and I like it! I love your blog. I’ve always been fascinated with the northwest coast of the States, and you’re the perfect window onto it! Plus you’ve done some remarkable work in the Himalaya, and that always makes me smile as it triggers fond memories. I hope you can continue with your passion. OH NO! Please don’t let the dream die! Could you benefit from a Kickstarter project? https://www.kickstarter.com/ I’m in for a personal small contribution! We’re all out here to make people’s dreams come true. Thanks a bunch Mary. Others have suggested that, plus another one called indiegogo (funny name!). I would need to offer something back in kind of course, I can’t accept charity. I can’t help feeling bad for you. What a terrible loss! I am glad you came to your senses and didn’t climb all the way down to reach your fallen gear. Thank goodness you were not hurt. These last images taken are beautiful mementos of your 5D III. Will still look forward to your excellent posts. Thank you very much Pat! A photo & travel blog with a difference: Instead of strict focus on photo how-to, gear and the like, I'll pass on knowledge about the places and cultures photographed. I believe the more deeply you come to know a place, the better your pictures will be. My past careers as science teacher and geologist mean that I can't help but teach about the natural history of photogenic places around the world. But photography is not forgotten. You'll also see practical tips about where and how to photograph the destinations. And once a week, Friday Foto Talk gives photography tips and how-to on a selected topic, for novices on up to expert. What you won't find here is endless discussion about me braving dangerous weather, terrain or wild animals to get the shot. Nor will there be cheerleading gear talk or marketing pitches. I promise to leave that to other blogs, of which there are many. Click Image Galleries to check out my main gallery page, where full-size, high-resolution images can be viewed, downloaded and purchased. Please Contact me if you have any questions or are interested in a specific image from this blog. Thanks! Enter your email address, then click Follow to receive notifications of new posts by email.